When you have to check a patient’s SpO2 levels on a consistent basis, a comfortable fit can make all the difference. 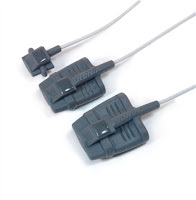 The Nonin 8000S reusable SpO2 sensors are soft fingertip sensors for the WristOx2 pulse oximeter. Made with a flexible rubber material, the sensor gently covers the entire fingertip, making it an ideal choice for spot-checking and short-term monitoring. However, these PureLight sensors also rise to the challenge when it comes to continuous monitoring. Due to their glove-like structure, they’re extremely comfortable for patients and withstand many behavioral patterns, such as tossing and turning, during sleep studies. If mere comfort isn’t enough, the level of accuracy and dependability the Nonin 8000S Series provides is impressive on its own. With common red LED sensors, there’s a chance that contamination (the production of a secondary spectrum emission) can occur, which may disturb the oximeter’s calibration curve. This disruption results in imprecise SpO2 readings below 80%. Nonin’s PureLight technology only produces the pure light spectrum and makes it possible for sensors to deliver a steady pulse, dismiss discrepancies in readings from patient to patient and give precise data during motion and low perfusion. For more options and information about our sensors or any of our other pulse oximeter accessories, visit Concord Health Supply today!